The Joshua Treenial 2019 Paradise :: Parallax is pleased to present two sonic performances set in the unique environment of The Integratron. The Joshua Treenial is a weekend of art, installations and performances that celebrates all that Joshua Tree inspires and makes possible. Per Platou will present a 20 minute three dimensional live mixed sound installation utilizing moving ultrasonic (hyperdirectional) loudspeakers featuring sonic content composed for The Integratron’s singular history. Platou, based in Oslo and Landers, CA, works with electronic media, sound art, radio, film and theater. He is currently directing the Norwegian Video Art Archive. Ivan Wong will present v=331m/s+0.6T, a 15 minute sound work featuring recorded sounds and acoustic instrumentation, vocals, and synthetic reproduction augmented by live sound manipulation via a soundboard. The piece, both spontaneous and controlled, is meant to envelop both the space it occupies and to reach beyond it, based in part on the idea that radio waves sent into the atmosphere can be refracted or reflected. New York-based Wong is an artist, musician, and composer whose works have been exhibited/performed on both coasts. He is also an accomplished publisher of art books. Wong holds a BFA in painting from UCLA. The Joshua Treenial is very grateful to the team at The Integratron for hosting these special performances. Price – $30/person. Ages 12 and up only please. SOLD OUT! Eric Rankin facilitates these very popular frequency events. 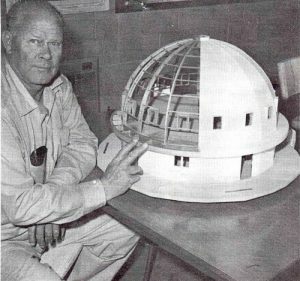 You can participate in his ongoing “Sonic Geometry” experiments in the Integratron. Please book EARLY, these sell out quickly! Eric has booked the dates listed below and you will reserve space directly with him. Each event begins at 12:30pm with a caravan out to Giant Rock, and then the opportunity to experience the Integratron as a frequency machine. Very few people know that the bottom floor of this structure is where “cellular rejuvenation” was to occur. Eric honors the original design and purpose of this vortex generator in the way that it was built. We believe his work delivers an in-depth experience of the Integratron’s energy field along with essential knowledge about energy, frequency and vibration. During this session, you will also get the full back-story of the Integratron’s creation, a refresher course describing Sonic Geometry, and then experience very specific sets of electronic frequencies. You will be amazed by what this structure does with energy, vibration and numerically perfect harmonics. Following a light dinner, you will get to hear organic frequencies in the sound chamber of the Integratron. After the tone session in the sound chamber, you will gather for a debriefing session before departing the grounds at 7:00pm. The cost is $144 per person. For full details and to register for the Sonic Geometry events, please visit the Sonic Geometry website. Watch Eric’s Sonic Geometry video, Sonic Geometry: The Language of Frequency and Form. Exclusive one-time event with limited tickets available, book soon! Bathe in the sacred vibrations of the planetary gongs inside the Integratron Sound Chamber. The purpose of the Integratron is the rejuvenation of the human body, similar to recharging a battery. It is located in the intersection of powerful geomagnetic forces that, when focused by the unique geometry of the power-enhancing dome, will concentrate and amplify the energy required for cell rejuvenation. It is recommended that you bring a sleeping pad / yoga mat, blanket, and a pillow for some Kundalini Yoga and Deep Relaxation.